Northwestern's students continue to benefit from the University's strong institutional partnerships around the world. 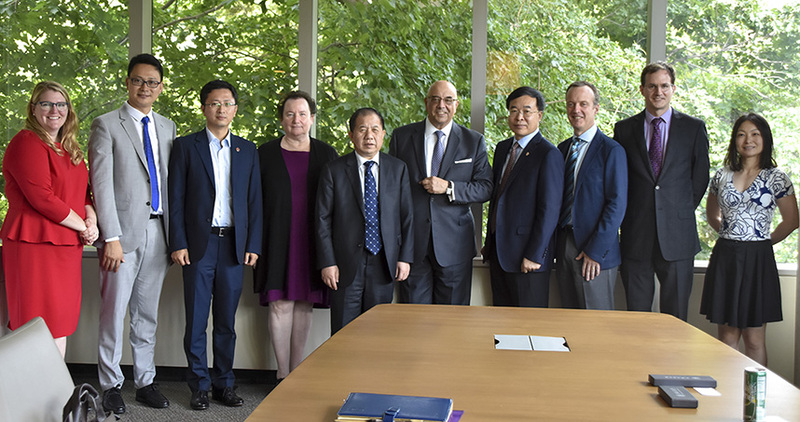 Last week’s signing of a memorandum of understanding between Shanghai Jiao Tong University (SJTU) and Northwestern University marked another milestone in Northwestern’s commitment to developing and expanding robust and sustainable relationships with prestigious universities abroad. This latest addition, a dual PhD degree program in biomedical engineering, comes on the heels of a recent agreement for a student exchange between Northwestern Pritzker School of Law and SJTU's KoGuan School of Law. Northwestern law students will begin studying in Shanghai in 2018. The McCormick School of Engineering has been collaborating with SJTU for several years on an undergraduate student exchange program in mechanical and biomedical engineering as well as a dual master’s degree program in materials science and mechanical engineering. "This new agreement is a very important step for the School of Engineering because this is its first dual PhD degree program,” said Matthew Grayson, associate professor of electrical engineering and computer science, and director of Global Initiatives at McCormick. "There are very few dual PhD degree programs in all of Northwestern. It’s not just a big step in increasing the collaboration between the two universities, it’s actually a very big step in helping to globalize the impact of the McCormick School of Engineering." Hosted by vice president for international relations Dévora Grynspan, the group met with several representatives at Northwestern, including President Morton Schapiro, McCormick Dean Julio Ottino, Northwestern Pritzker School of Law Dean Dan Rodriguez, associate director of the International Institute for Nanotechnology Teri Odom, and Rex Chisholm, vice dean of scientific affairs and graduate education at the Feinberg School of Medicine. With agreements in place in engineering and law, SJTU President Lin is now turning his eye toward developing relations with the Feinberg. Presidents Lin and Schapiro signed the latest agreement during an official ceremony and shook hands, ensuring continued close collaboration between the two institutions.